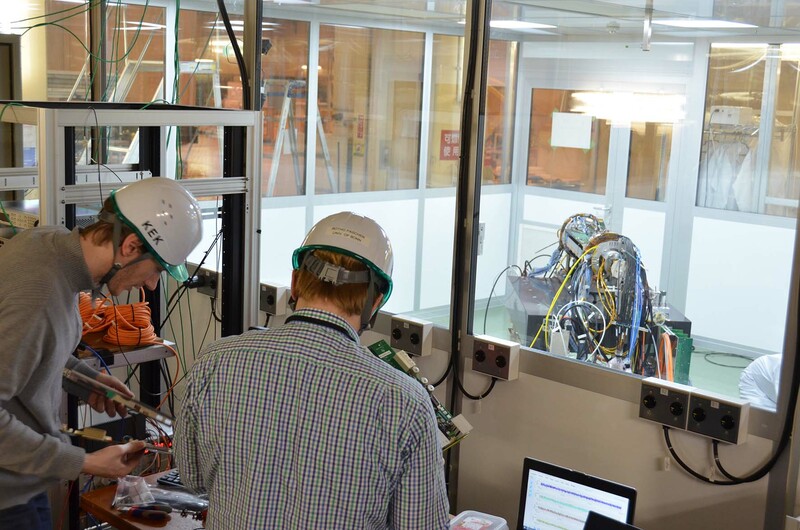 In preparation for the next-year commissioning of BelleⅡwith the first collision of electron-positron beams at the SuperKEKB, the last test of BEAST detectors started at Tsukuba Experimental Hall, KEK Tsukuba campus on October 31. It is planned to insert into the core of BelleⅡin late November. At the core of the BelleⅡ, two type of semiconductor sensors (PXD: Pixel Type Semiconductor Detector, and SVD: Silicon Vertex Detector) will be inserted for measuring the decay position of the short lived particles. Just outside the beam pipe, two-layers of PXD based on the DEPFET technology, followed by four layers of SVD which extends from just outside the PXD to a larger radius will be installed. Positon information for charged particles is obtained from electrical signals produced as they pass through a silicon sensor. As compare to the BelleⅠexperiment, the core sensors of BelleⅡwill be closer to beam pipe and extend to a larger radius. These give an improvement in the detection efficiency for B mesons decaying positions and precise track of particles with smaller momentum. 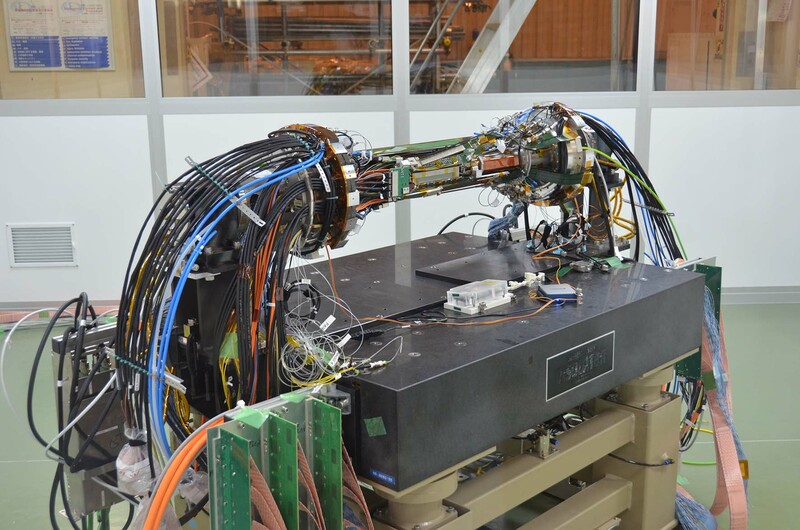 At the next-year commissioning of BelleⅡ, the real core detector will not be installed. Instead the BEAST detectors which contain a small sector of the PXD and SVD will be inserted. The rest of the inner volume of the BEAST is populated with dedicated radiation monitors. The goal of such detector system is the study of the machine induced backgrounds that could damage the PXD and SVD in the physics run. In the SuperKEKB accelerator, the instantaneous luminosity will be up to 40 times greater than KEKB and the machine induced background, scattered particles from the beam pipe and X-ray from beam itself, could be much greater than that of BelleⅠexperiment. 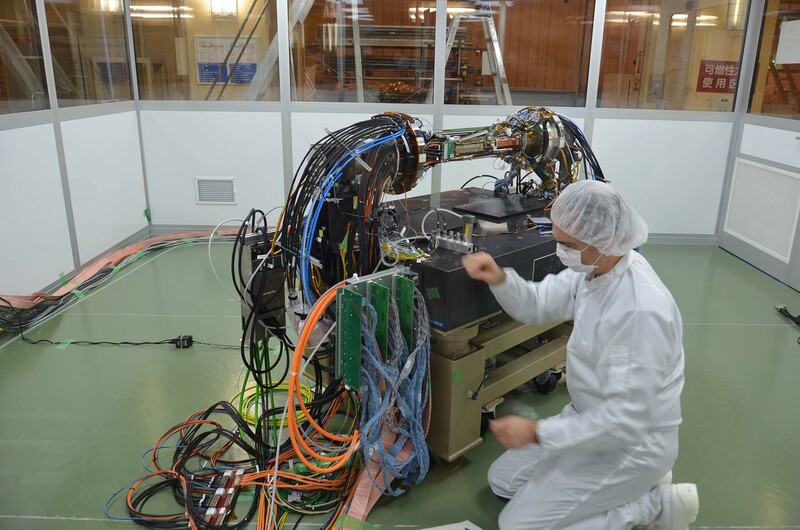 On the first day of the test, researchers tested the BEAST detector system before the final installation in the clean room at B4 floor of Tsukuba Experimental Hall, where it was assembled. The sensors were cooled by CO2 gas to perform the test at the similar operating temperatures.